Hanoi (VNA) –The cooperation between the Communist Party of Vietnam (CPV) and the Mozambique Liberation Front (Frelimo) needs to be developed in a more effective and practical manner for the common benefits of the two countries’ people as well as for peace and development in the region and the world. 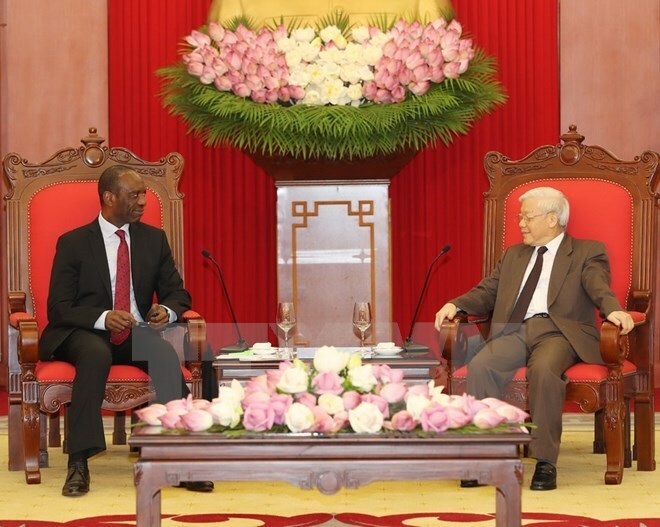 Party General Secretary Nguyen Phu Trong made the affirmation while receiving Mozambican Prime Minister Carlos Agostinho do Rosario in Hanoi on August 1. He spoke highly of the valuable, effective support and assistance that the Mozambican Party, State and people have given to Vietnam during the past struggle for national liberation as well as in the current national construction and defence. He congratulated Mozambique on its political and socio-economic achievements gained under the leadership of Frelimo over the past time. Party leader Trong also highlighted that the fine CPV-Frelimo relationship has contributed to promoting the traditional solidarity and friendship between the two States and their people. For his part, the Mozambican PM valued Vietnam’s achievements and experience in national development as well as its prestige and position in the region and the world.